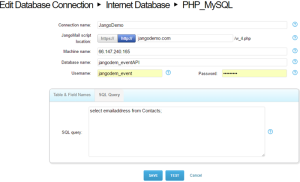 JangoMail can connect to a web database, or roughly speaking, we can connect to your database over the internet. This requires us knowing the IP address of the database server, the database name, a database username, and that user’s password. Additionally, you have to place a “helper” file on your server, the exact version of which depends on the type of database you want JangoMail to connect to. In this example, we’re connecting to a MySQL database. 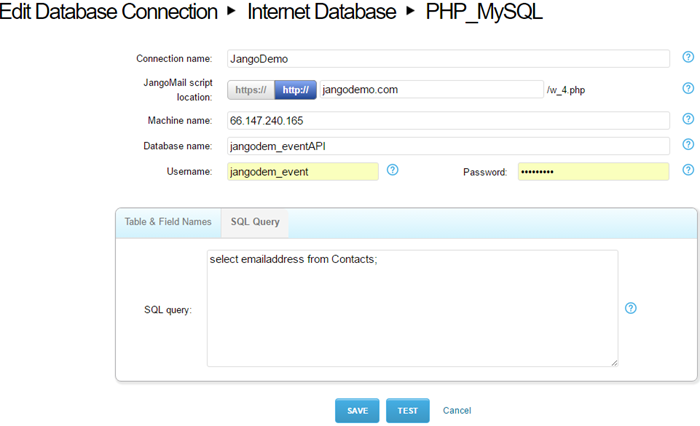 Specifically, it is a MySQL database hosted at HostMonster within my jangodemo.com account. 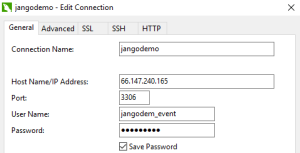 Obtain the connector/helper file from within your JangoMail account. Create a new database, select Internet Web Database, and click the icon/image for your database type. For the MySQL example here, it’s the one on the right. A w_4.php file will be downloaded, and then place that file into your domain’s root (public_html) directory. 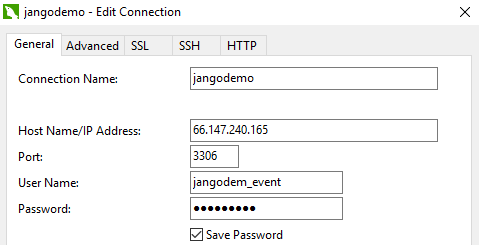 Before trying to connect JangoMail to your database (or as a troubleshooting step), ensure you can connect to your table(s) of interest via a remote connection from elsewhere. For this test, I used Navicat for MySQL (it comes with a 14-day free trial). 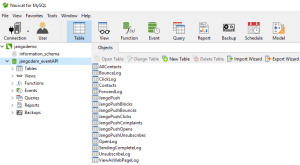 When running your database client, you should be able to connect to your database and query whatever from a table. You should also be able to do the same if you are in a hosting environment, typically using phpMyAdmin or some other tool/utility your hosting provider shows in its cPanel. After connecting to the database of interest, you can create tables as needed (not covered here). In the picture below, I have collector tables for the JangoMail event API feature, along with some other tables. Test the connection, and if successful, click Save. 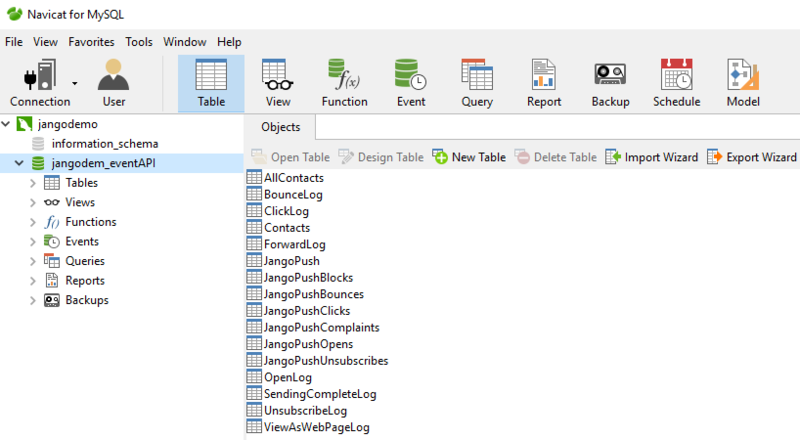 To access the database while creating a new message, connect to the database in the Databases tab, and once the data is pulled, you’ll be taken to the Messages page. All three records were pulled based on the query. If you need to filter your data, then edit the query to reflect what you need via a WHERE clause.